I recently returned from a road trip with a very special twist. 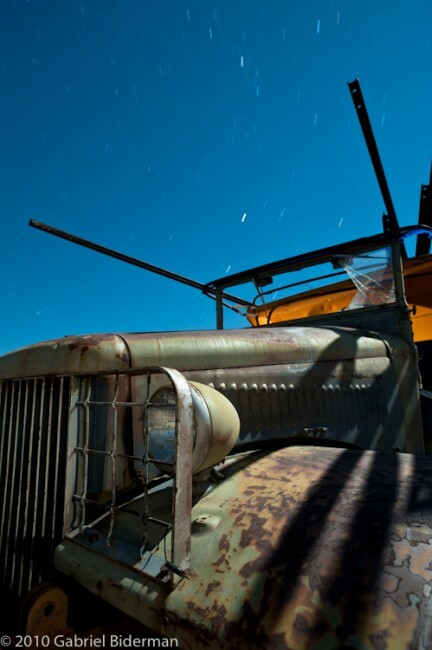 It started with an opportunity to attend The Pearsonville Workshops, a unique night photography experience that takes place in an old-school car junkyard in the southern Mojave Desert. 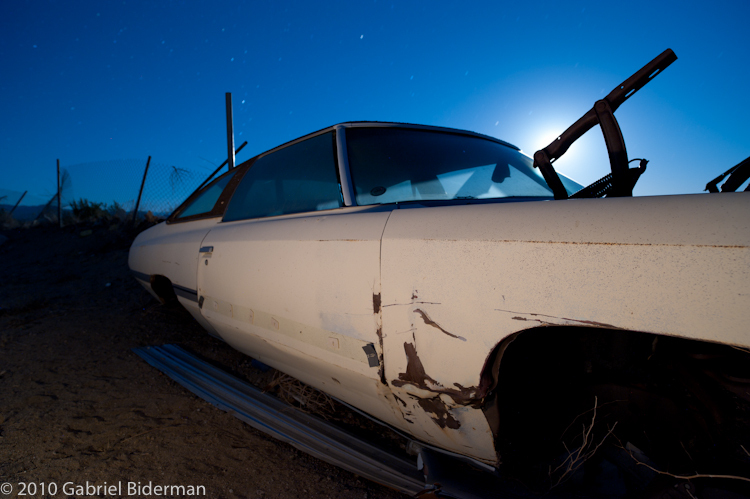 Hosted by my good friends and night photo gurus, Troy Paiva and Joe Reifer, it was my second opportunity to get access to this incredible location during a full moon. It also fell right at the beginning of my 10 day vacation. 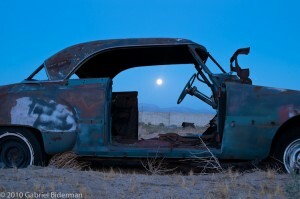 The Mojave is an amazing place to shoot day or night, and with my father, Barry, and friend, Heidger, already on board to take the workshop, why not extend 3 nights of shooting to a full week? With our tripods extended over a sacred stone, we pledged to photograph for seven straight nights, exploring what was later to become a very surreal journey from the Mojave to Mono Lake. 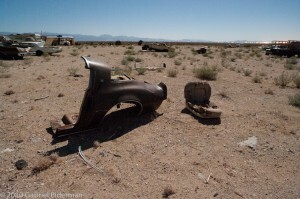 This mostly desert area of the now Eastern Sierras of California was once connected by a chain of inland lakes that stretched from Mono Lake to Death Valley. Now it is connected by the scenic Interstate 395. But 10,000 to 100,000 years ago calcium-rich groundwater and alkaline lake water combined to grow tufa formations deep beneath the Searles Lake, which encompassed much of the now Southern Mojave Desert. 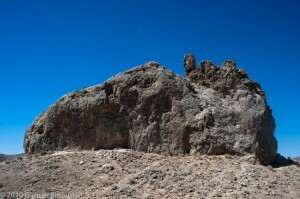 Today, the Trona Pinnacles has over 500 tufa formations rising from the bed of the Searles Dry Lake Basin. And so we chose this amazingly surreal geological wonder to be Night 1 of our trip. 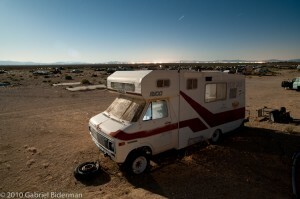 Barry, Heidger, Susan and I piled into my car and we drove the 20 miles from Ridgecrest to Trona. “Watch for the marker signs on the right that will lead you down a dark dirt road to the Pinnacles.” Joe had warned us. Highbeams lighting the way, we lumbered down the gravel road passing railroad tracks and…signs for Aero Films Company? When we finally reached our destination, there were two large white storage trucks waiting for us with their motors running. We approached the driver, who was probably more surprised to see us than we were to see him! They were with Aero Films and were guarding all the film crew’s gear for a car commercial that was to be shot there early the next morning. We chatted it up with Steve and told him that were on a photographic mission and would be shooting for the next few hours. He agreed to turn off his headlights if we agreed not to shoot near his vehicles. This wasn’t a problem and it was one of the friendliest encounters I had ever had with a security official at a night location. 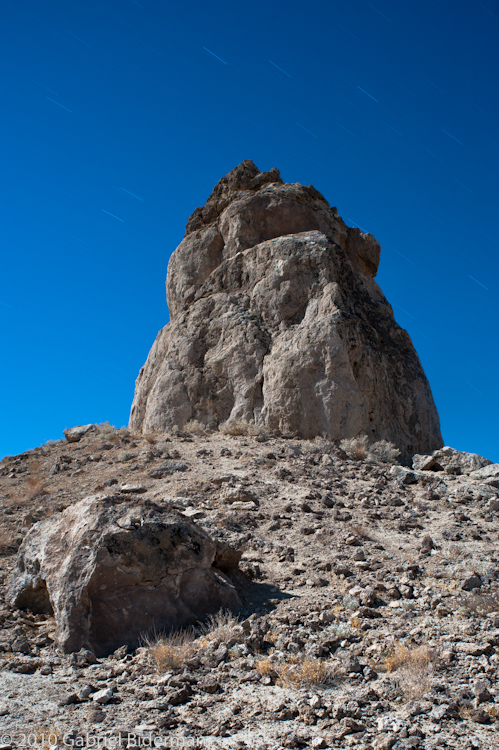 The Trona Pinnacles is part of the BLM and has no rules against photographing or camping at night. So for the next 4 hours we wandered through the 30′-40′ towers of the “Cathedral City” letting the moonlight guide our way. The night-light only heightened this surrealscape which reminded me of Turkey’s Capadoccia Region. The incredible thing about Capadoccia was that people actual carved into these tufa formations and created homes, churches, and an incredible hidden city. 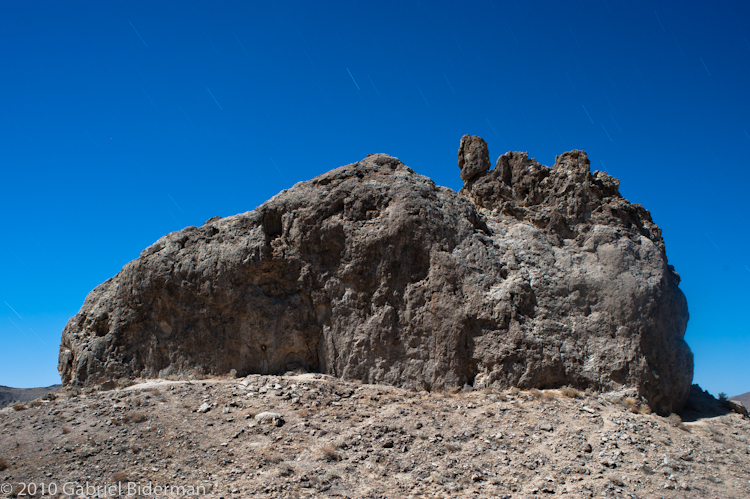 We didn’t get to explore all of the Trona Pinnacles, but we saw no sign of any past human inhabitants! 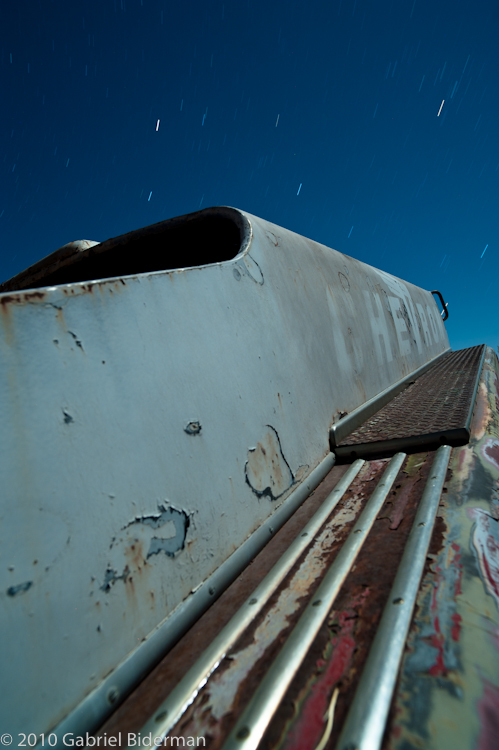 Nights 2, 3, and 4 were spent under the tutelage of Joe Reifer and Troy Paiva as we explored the expansive Pearsonville Junkyard. 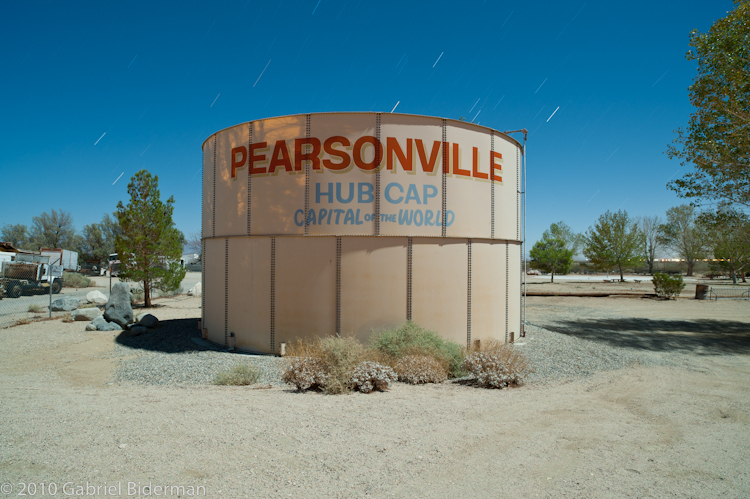 Known as the hubcap capital of the world, Pearsonville features an incredible collection of cars from the 30’s -70’s as well as a race track. The track hasn’t been used for years, in fact the junkyard as a whole probably has a limited lifespan. So, if any of these images inspire consider taking the Pearsonville Workshops in 2011, while supplies last! 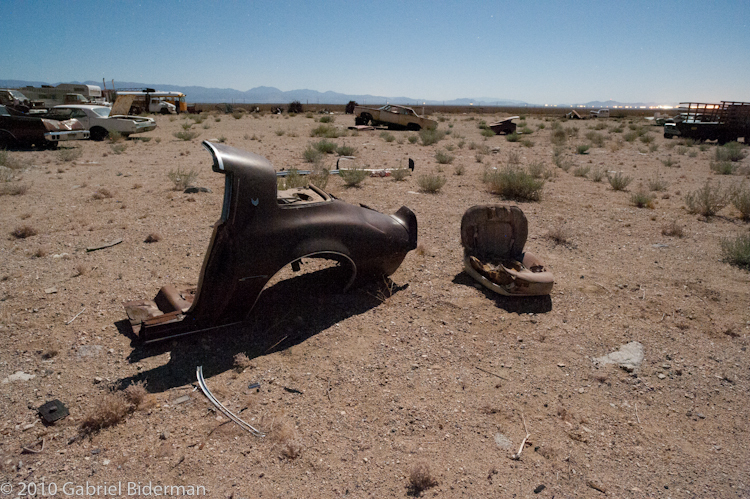 However, just like the Trona Pinnacles, when the sun goes down, the moon turns this junkyard into a post apocalyptic landscape. And I do like that! The Full Moon greeted us on Night 2, which was coincidentally the Autumnal Equinox. This Super Harvest Moon signals the change of seasons and hasn’t directly fallen on the Autumnal Equinox for 19 years. It was a beautifully clear night, so a few of us scouted out locations to catch the moonrise. The days and nights share almost equal time around the equinox, so there was a very good chance to catch the moon rising while there was still a few licks of daylight left in the sky. This would have been heightened more if there would have been any clouds in the sky to reflect the fading sunlight. I chose a hollow old car to shoot through as the moon began to rise, see image number 4. The nights were pretty warm, in the upper 70s, and this actually affected how we captured our long exposures. For digital capture I prefer to shoot my Nikon D700 at its native ISO of 200 and expose for 6-8 minutes during a full moon. I also prefer to turn my Long Exposure Noise Reduction filter off. All SLR cameras have noise reduction filters that can be turned on or off. 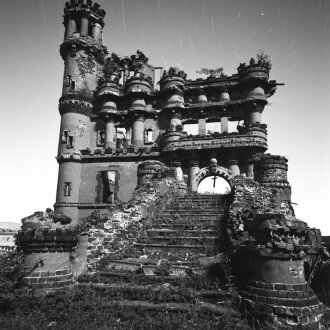 If you have it turned on, once your exposure is compete, the camera will take another “picture” of a black frame and stack it onto your previous image. This stacking of images is called “dark frame subtraction” and is basically a little “in camera photoshop” that minimizes the amount of noise in your image. Great you say, but in most cameras this dark frame subtraction usually takes the same amount of time that you exposed the original picture. So an 8 minute exposure is now a 16 minute exposure with noise reduction on. That’s right, you can’t fire your camera or press any buttons until the dark frame subtraction is complete. This also drains your camera battery quickly and is definitely not the most productive way to photograph. A good way to check how your camera is handling the long exposure noise is to take a photo without the NR filter on and then zoom into the image on your LCD screen. Try to get a portion of the sky in your image as it is easy to find noise there. If you find red spots in the sky, you’ve got noise. As it turned out, most of us were experiencing noise at exposures of 4-6 minutes, so we had to make a choice: shorten our times or sit and wait for our cameras. I ended up doing a combination of both. Shorter exposures can lend themselves to being stacked nicely post-process and achieve nice long star trails. Joe has a great explanation on how to do that on his blog. Joe and Troy are excellent educators, each sharing their two distinct night visions with our class of 12. I tried to spend a few hours each night and sponge some of their light painting and other night techniques. 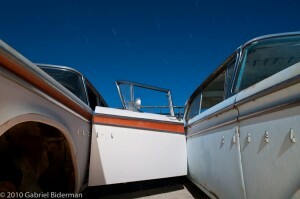 In most of my images I tended to move in close and reinterpret the vehicle. However I do feel you get a better sense of the space in the images where I stepped back and shot, the RV and abandoned rear end of the car for example. It is easy to get lost within yourself at Pearsonville. You walk 2 feet and another cool car or shape takes form before your eyes. The lot isn’t that big but with close to 600 cars, I’ve barely scratched the surface! By the end of the Night 4 there was still a large area of the lot that I had not explored. Troy and Joe have logged in close to 30 nights each at Pearsonville and they are still finding new work. You have to check out Troy and Joe’s body of work. Their images will blow your mind and Joe’s blog offers some of the best guidance on night photography on the web. 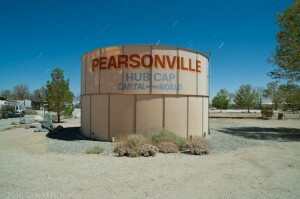 You can find the Pearsonville 2010 Fall class’ work on Flickr. I also enjoyed revisiting my images and blog from my last trip out to P-ville back in the spring of 2009. Thanks Brandon! We would arrive at the Junkyard an hour before sunset and shoot until 1am….and very rarely did we want to stop and wrap it up! I am getting great results from my Zeiss 21 but I also use a Nikon D700 which is 12MP…Joe uses a 5D2 which has almost twice the amount of megapixels. These higher MP cameras do tend to show of any flaw in lens, whereas the under 15MP are much more forgiving. I’ll definitely take you up on the offer for some 8×10 prints, thanks B! this stuff is AWESOME! you left out info we want to know – like what exact times were you shooting? it’s getting dark at 5pm now – but i have a feeling you are shooting til crazy hours – do tell! i started looking at joe’s blog but couldn’t easily find more car stuff. how are you finding you contax 21 after all the talk he has on it? and yes the dark exposure 2nd shot is a hassle! have you printed them? send me the files you want 8×10’s of. on disk – i’ll print what you want – 25 to start good?